When Scott and I decided to move abroad, we spent months reading and researching countries and towns, but we both knew from traveling that there is only so much you can get from paper and pictures. At some point, you really have to visit to understand what you’re getting into! I distinctly remember the house in Portugal I was so excited about only to discover upon arrival that the neighbors were on top of us and the bedrooms smelled like they hadn’t been used since they were built, judging from the linoleum on the floor, probably in 1964! It was awful. We managed two nights before finding another villa ten minutes down the beach. So with that experience in mind, we decided to use this summer to scout out the towns we were considering up and down the coasts of Spain. We narrowed it down to four places (Frigiliana/Nerja, Javea, Casares and Gaucin) and rented a house for three weeks in each. Our four choices were based upon being relatively small (we didn’t want to live in a city,) near the beach, having an international school nearby and still having a flavor of Spain. While you might wonder about this last thought, given we were moving to Spain, wouldn’t everything have that flavor, we knew that towns along the Costa del Sol were fairly developed resort towns. We weren’t looking for a Marbella or Malaga experience, which are mostly tourist destinations and home to Brits looking for better weather than England offers, so we looked on Google maps for towns up off the coast by about 30 minutes. By this point in our journey, we had been to three of the four towns and had a few days to thin-slice each of them. (If you haven’t read Blink, by Malcolm Gladwall, you should! It’s about making decisions with your gut, taking a “thin-slice” of something and going with it, instead of over-analyzing and second-guessing yourself.) So we were off to see Gaucin and get our first live impression while we were in the general area. 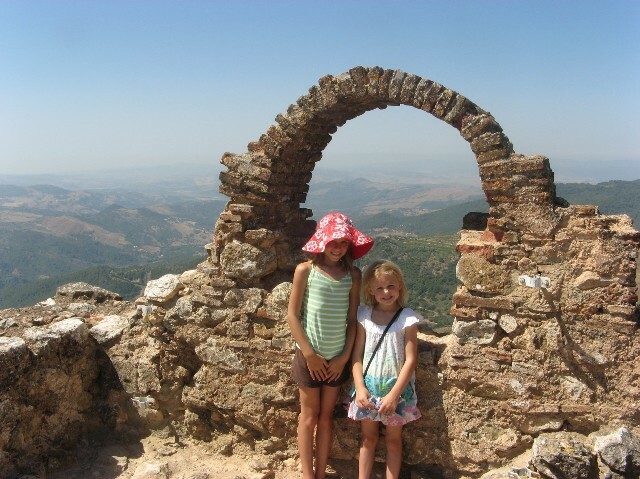 (We were not staying in Gaucin until August so wanted to have a look before heading up north to Javea for most of July.) Upon leaving Casares, which I’ve said, was beautiful but perhaps too small for us, we headed up the mountains further. It only got better in terms of the scenery! Perhaps living in Boulder, I’ve fallen hard for mountain living, because these mountains here too were speaking to me! Beautiful colors and forests, dramatic in how they suddenly rise up and drop off. And then we came upon the goats! That must be the Kansas farm-girl in me! 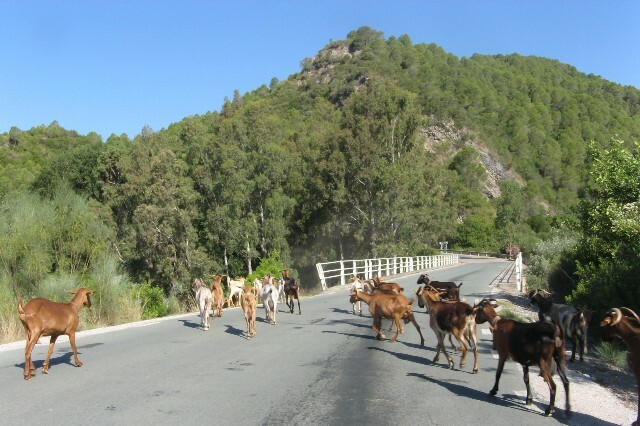 A herd of goats were on the road in front of us, their bells tolling as they scampered across the road and headed down to the creek for water. Our car was surrounded by them, the girls squealing their delight, me whipping out my camera, of course! 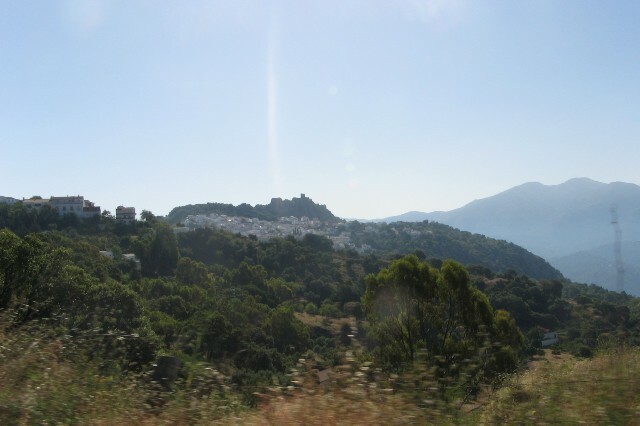 So far I was enjoying the drive to Gaucin and eager to see if it offered the beauty of Casares with a few more people and restaurants….and perhaps a bookstore? The village itself finally came into view, perched too on top of a mountain, as all good villages do to naturally defend themselves from invaders hundred and hundreds of years ago. We turned into town and found parking straight away, in front of the organic market, none-the-less. Hum. No signs for a tourist office so we went into the market for some general directions. It reminded me of what homegrown Wild Oats must have been like when it opened in the 60s or 70s. Fairly small but full of fresh vegetables and fruits, natural soaps and sunscreens and even two computer terminals for that elusive internet connection! Hum. We spent the morning wandering around and taking our thin-slice. It too offered amazing views of the countryside. Breathtaking, relaxing, calming. I could envision waking up to a coffee and time on the terrace watching the sun rise. It was bigger than Casares, more restaurants and shops and what looked like a fairly new public school. That might prove to be the deciding factor as we were still not able to enroll without our visas. The drive back to Nerja, about two hours, gave us time to ponder. Gaucin offered the most so far from a small Spanish village, but was it enough for a long period of time? A perfect relaxing vacation for sure, but I still needed to think about a year there. Perhaps Gaucin would take more than a blink!